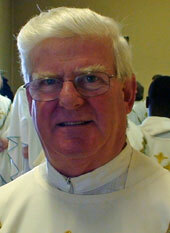 The Irish Province of the Society of African Missions mourns the loss of Fr Paul D’Arcy SMA who died at 3.15am on Tuesday, 27 April 2010 in the Bon Secours Hospital, Cork. Paul was born on 16 January 1945 in Castlebar, Co Mayo, the son of the late Donal and Margaret Helena D’Arcy (neé O’Sullivan, from Belmullet). The youngest of five children, he is survived by his brothers Donal and John, their wives Clare and Peggy, his sister-in-law Mary, nephews and nieces. His brother Pat and sister Mary (Corkery) and her husband predeceased him. Funeral homily here. He attended St Patrick’s National School and in 1957 moved to St Gerard’s De La Salle College, Castlebar for his Secondary education. During his time in De La Salle he excelled at several sports and played corner-forward on the Mayo Minor Football team. An accomplished soccer player he was once suspended from the GAA for playing the ‘foreign game’! But Castlebar Mitchells soon had one of their star players back on the field. He was also a talented Basketball player. When his father retired from the Bank of Ireland he brought his family to live on the northside of Dublin, in Sutton. After completing his Leaving Certificate in 1962 Paul decided to study for the missionary priesthood with the Society of African Missions (SMA). He entered the Society Novitiate at Cloughballymore, Co Galway (1962-1963) and then went to the African Missions Seminary in Dromantine, Newry, Co Down. He became a permanent member of the Society on 11 June 1968 and was ordained a priest in St Colman’s Cathedral, Newry on 18 December of the same year. After completing his studies he was appointed to Nigeria. He arrived at the SMA House in Kagoro, Kaduna State in 1969 where he spent several months being initiated into the language and customs of the people he was called to serve. In 1970, having completed the Tyrocinium programme, he was appointed to the diocese of Jos where he served in several parishes, including Shendam, Kwa and Pankshin. His ability in the Hausa language was noted by his Superiors. As a result he was asked to teach Hausa to the newly-ordained priests arriving from Ireland. In 1980, Paul was recalled to the SMA House, Blackrock Road, Cork to take responsibility for the SMA Promotion Office. He spent six years in this work as Office Manager. In 1986 he was seconded to the SMA British Province and served as Provincial Secretary and Mission Appeals Organiser. During his 10 years with the British Province he undertook Further Studies and gained a BA. In 1995 Paul wanted to return to fulltime pastoral work and was released by his Superiors to work in the diocese of Arundel & Brighton where he served for 10 years before taking a Sabbatical break (2005-2006). On completion of his sabbatical he was appointed Provincial Secretary, a post he served in until his death. Paul was a noted sportsman, in school, seminary and was a keen golfer in later years. He instigated the Provincial Golf competition in the early 1980’s. He took great pride in the achievements of his nephew, Gordon, who plays rugby for Leinster and Ireland. His other interests included Crosswords and Quiz programmes. Fr Paul’s remains arrived at the African Missions (SMA House), Blackrock Road at 5.30 Tuesday. The Rosary was recited at 7pm in the Community Chapel. His remains were removed from Blackrock Road at 7pm, Wednesday to the St Joseph’s SMA Parish Church, Wilton. The concelebrated funeral Mass took place at 12 noon, Thursday with burial afterwards in the adjoining community cemetery. Ar dheis Dé go raibh a anam dílis. Requiescat in pace.